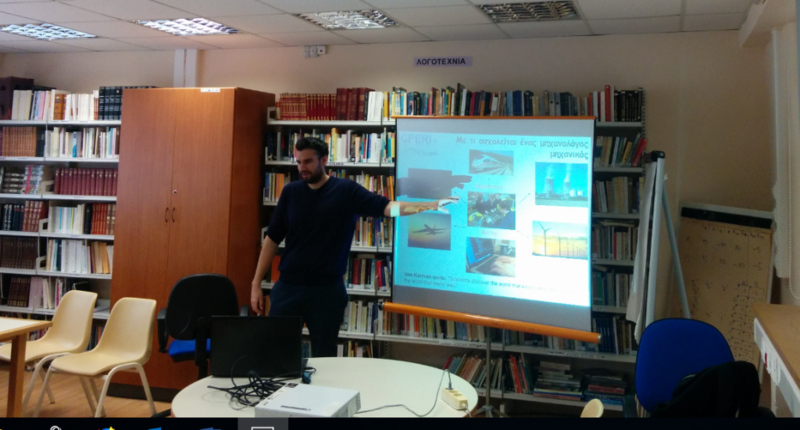 The CERTH ESRs implemented each an outreach activity in two different high schools in Greece: Mr Dionisis Stefanitsis (ESR 8) visited the 1st Lyceum of Papagou in Athens and Mr Stavros Fostiropoulos (ESR9) the 2nd Lyceum of Piraeus. They both focused on the everyday life of a researcher based on their own examples. They highlighted the role of the scientists in the community and the skills required to become a successful researcher in the engineering field. They also presented the opportunities offered to young researchers by the EU programmes. Mr Stefanitsis made his presentation during a chemistry course and Mr Fostiropoulos addressed to high school students with prior knowledge in fluid mechanics. As both audiences had basic science knowledge the ESRs introduced the students also to their research field: they gave examples of where fluid mechanics can be applied and they showed indicative results. Due to the simple and clear content of the scientific part, they managed to trigger an interesting discussion with the students and their teachers. The main purpose of these activities was to motivate students to pursue a career in a research field and to highlight the advantages of being a researcher. Judging by the questions of the students at the end of the presentation both activities were very successful; the students wanted to know more about the opportunities offered to a young researcher. At the end of his activity Mr. Fostiropoulos asked the students to complete a questionnaire, as he wanted to measure the impact of the activity on his audience. He was pleased to see that almost all the students that attended the activity wanted to receive even more information about research related carriers and the opportunities available.